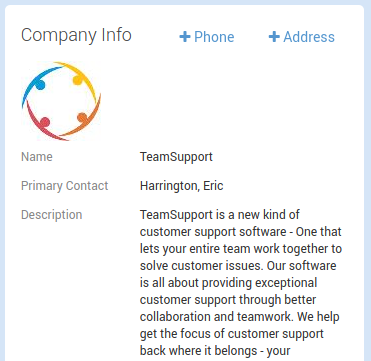 TeamSupports offers our Customer Insights feature which automatically pulls data from publicly accessible data sources including a Contact’s photo and LinkedIn profile, and the Company Logo and Description. The Contact avatar will be displayed along with any action that is created by the Contact on a Ticket. Additionally, these avatars may be included in outgoing emails. Simply type in the company’s website into the “Website” field, and the system will discover the Company Logo and Description. If you have already included a Company Description, Customer Insights will not overwrite this field. Simply type in the contact’s email address into the primary email field, and the system will discover the Contact Photo and LinkedIn profile. If you have already included a Linkedin Profile, Customer Insights will not overwrite this field. This feature can be disabled in My Company Settings. It may take up to 24 hours for this information to be pulled into TeamSupport. The service is “once and done”, so continual updates are not made.